6 colors with an aqueous coater - maximum sheet size of 20x28. 5 colors with a maximum sheet size of 14x20. 2 colors with a maximum sheet size of 13x18..
Ryobi 3200 2 colors with a maximum sheet size of 11x17. Maximum sheet size of 11x17. Our HP Indigo Press is not a color copier -it is a digital press that uses liquid ink to give you the look and feel of offset printing in a fraction of the time. 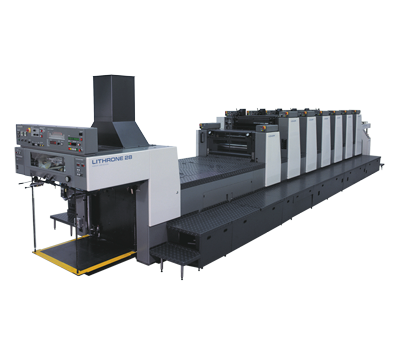 In addition to its stock versatility, the HP Indigo Press provides an expanded gamut of PMS spot color options. With its unique and powerful benefits, our Indigo Press will become your new best friend. 5 colors with variable data capability and a maximum sheet size of 13x19. Fastest B&W copier on the market with a maximum sheet size of 12x18. 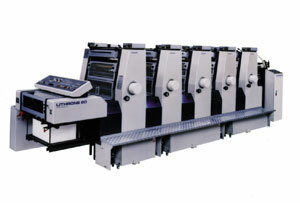 Offers inline folding, booklet stitching and stapling.